Dominique Crenn was named Esquire's Chef of the Year in 2008. Esquire is all over the place when it comes to food--they thought that Le Tub was the second coming of Jeebus. 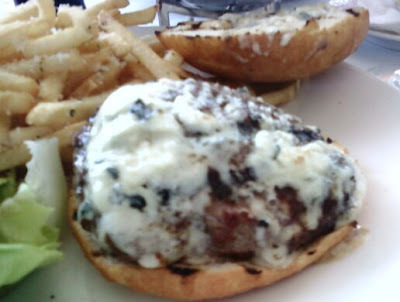 One can only hope that she had nothing to do with the cheeseburger that was served during the lunch hour at Luce. I was impressed enough with the kitchen's attention to detail at breakfast to schedule a lunch meeting at Luce. The potatoes were perfectly diced bordering on brunoise, and this spoke well of the guiding hand in the kitchen, or so I thought. The bun---(see photo) had char marks on the inside and outside to insure that the bun was infused with the unpleasant taste and smell of pungent burnt starch--YECH! The beef, while it was all-natural, Niman Ranch (made from real cows), was not ground in-house, so it yielded all of its nuance and aged flavors to the fluid and plastic bag in which it arrived. Sear--merely adequate, but the grill left much to be desired. Surely, there was a griddle or a plancha or a heavy skillet in that big ole kitchen. Med Rare--yep, they nailed that. Cheese--Bleu. It crushed the burger into oblivion--it was all that I could taste. It didn't so much mask the flavor of the weak burger as it made the lack of hearty flavors in the meat even more apparent. Meat to Bun Ratio--really good, but the bun was burnt, so whatever. The Value--$14 bucks for pre-ground Chuck on a burnt bun. The value was shameful. 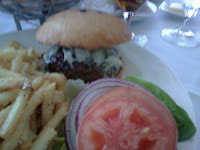 Burger Review : This was just a hotel burger and a lousy one at that.